Successfully Added 6 Packed A19 E26/E27 LED Bulb, 60 Watt Equivalent 11W Daylight White Bulb Light to your Shopping Cart. 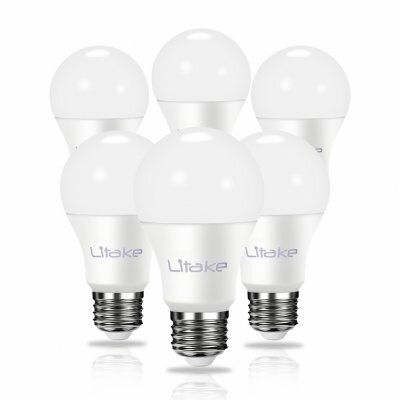 ENERGY SAVING: One 11W bulb is equal to a 60W normal incandescent bulb, save over 80% on electricity. WARM AND BRIGHT: The bulb is made of 1000LM LEDs with high brightness and gives off 3000K white light. HIGH QUALITY: The bulbs with low light decay are CE, FCC and RoHS certificated, no mercury and UV/IR light included. LONG LIFE-SPAN: The bulb can be used for more than 25,000 hours. VERSATILE: Applied for corridor, home balcony, toilet, public aisle etc. The standard A19 bulb can fit most lamp holder well. The LED bulb does not use toxic mercury, safe and environment friendly. Also, it does not give UV/IR light.